The Camden Coalition’s Faith in Prevention program is kicking off its fifth year with ambitious plans to help even more faith-based organizations tackle chronic disease and promote and sustain health and wellness in their congregations. We’re seeking 20 congregations that serve Camden city residents to take part in this year’s program. Chronic disease is common in Camden County, which ranked 19 out of New Jersey’s 21 counties in health outcomes. Many people in the county’s faith communities rely on their congregations as their main source of social support, education, and information about community resources. That’s where our Faith in Prevention program comes in. “We want to encourage vulnerable communities in Camden County to adopt healthy lifestyles and nutrition by making powerful connections between their health, faith, and healing,” said Maritza. This year, faith leaders of participating organizations will be trained to deliver a new and improved curriculum to their congregations. The evidence-based curriculum, now named Faithful Families, Thriving Communities, has been adapted to better address the diverse needs of faith communities and partners. In addition to encouraging healthy eating and physical activity, the revamped curriculum aims to inspire organizations to become vocal advocates for community health in their local communities. Participating organizations will have the opportunity to apply for $4,500 for creative projects to promote the health of their congregations and communities, and are connected to local resources, coalitions, and community organizations. Plans are in the works to build on our pilot program that connects congregants to the Camden Coalition Health Information Exchange, providing them the opportunity to opt in to let their faith leaders know if they are admitted to the hospital. Three more faith-based organizations are being recruited to join the effort beginning this January. 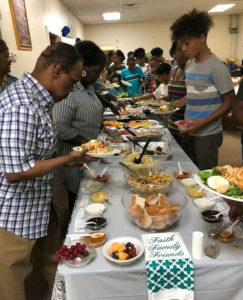 St. John’s Church of the Apostolic Faith (SJC) in Camden completed the program in August and is already implementing changes to benefit its congregants well beyond the six-week program. One congregant, Alyssa Wilds, shared her experience in a recent blogpost for the New Jersey Healthy Communities Network. Faith in Prevention has a rolling acceptance for organizations that apply for the program. To learn more, visit our Faith in Prevention webpage.